The League Bloggers Awards (LBA) has shortlisted four players and four managers to vie for the January player and manager awards respectively for their performances in the Nigeria Professional Football League (NPFL). Five rounds of matches were played in the month under review in which Kennedy Boboye of Plateau United is joined by MFM FC gaffer Fidelis Ilechukwu, Henry Makinwa of ABS FC and Gbenga Ogunbote of Enyimba for who gets the manager award for January. Boboye led Plateau United to four wins and a draw. His team began with a win at Remo Stars and followed up with back-to-back home victories over Sunshine Stars and Enyimba with similar 3-1 scorelines before playing out a 0-0 draw at Gombe United. Plateau United then wrapped up their NPFL outing in January with a 2-1 win over Abia Warriors to top the league with 13 points. Ilechukwu had a decent month as well, winning three matches and drawing one with MFM. The only blip suffered by Ilechukwu's team in January was a heavy 0-4 defeat at FC Ifeanyiubah. ABS FC managed by Makinwa also notched 10 points like MFM FC. Makinwa masterminded victories over Akwa United, FC Ifeanyiubah and 3SC and earned a point in a 1-1 draw at Niger Tornadoes but were beaten 1-3 at Lobi Stars on January 25. Enyimba gaffer Ogunbote completes the quartet of managers nominated for the January LBA. His team, like those of Ilechukwu and Makinwa, got 10 points out of the 15 available in January after wins against Sunshine Stars, Gombe United and Nasarawa United. The Peoples Elephant's only loss was at Plateau United while they got a point off Abia Warriors in Umuahia in the Abia derby. 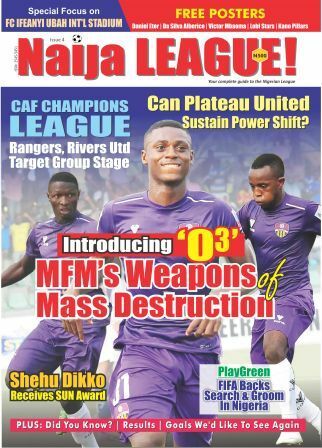 MFM FC duo of Sikiru Olatunbosun and Stephen Odey, Plateau United's Kabiru Umar as well as Rivers United goalkeeper Olufemi Thomas are in the running for the player's award. Olatunbosun provided the most assists in January being three. He also scored twice in five appearances while his teammate Odey scored four goals in four matches. He weighed in with an assist too. Rivers United stopper Thomas was in goal for just two games in January against FC Ifeanyiubah and Lobi Stars, and kept clean sheets in both. Plateau United forward Umar got into the mix on the back his two goals and two assists in January. The striker was very influential in his teams fine run in the month under review. The LBA Player and Manager for January in the NPFL will be announced this week.